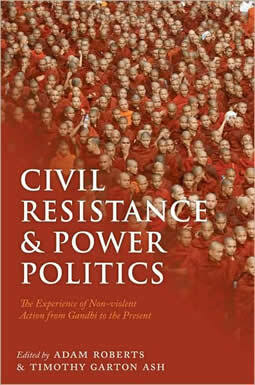 Christina Fink outlines in her chapter on Burma that civil resistance may not succeed if the state remains coherent and determined to oppose the demands of protestors. To succeed, the forces of civil society must be able to impose their will by strong and popular action. This is what happened in Poland in the 1980s. The ruling Communist Party lost its legitimacy in the period 1980-82, and the imposition of martial law was unable to restore its hegemony. The result was that by 1989 the alternative power of Solidarity was able to form a government because elections indicated the vast unpopularity of the Communist Party. However, the situation could have been very different in Eastern Europe if the Soviet Union had decided to intervene. In the period, 1980-82, the unwillingness of the Brezhnev leadership to interfere was not because of principle but rather expressed expediency. The Brezhnev doctrine had upheld the willingness of the Communist Party of the Soviet Union (CPSU) to interfere in the affairs of Eastern European nations in order to “defend socialism”. But Poland’s massive debts represented a formidable reason why the CPSU in 1981 was unwilling to invade Poland to block Solidarity. In 1989, Gorbachev was against intervention on principle concerning internal affairs in Eastern Europe. A precedent was established in relation to the election of a non-communist government in Poland, and was extended to the process of peaceful change throughout Eastern Europe. This development is explained in the chapter by Mark Kramer. He raises the important question as to whether the process of change in Eastern Europe could have been so orderly and smooth if Gorbachev’s policy had not prevailed. Kramer argues that Gorbachev supported the process of change in Eastern Europe in order to avoid the prospect of Soviet armed intervention against what had become direct anti-Soviet uprisings. But the dynamic of Gorbachev’s actions was the demise of the Soviet Union which had been weakened by events within Eastern Europe. In other words, glasnost and perestroika had meant that it was not credible to try and repress the struggle for change outside of the Soviet Union. This analysis indicates that the process of civil resistance cannot succeed without the effective fragmentation and collapse of the state order. A vital aspect of the process of change within Eastern Germany was the increasing reluctance of the state apparatus to oppose the mass power of demonstrators. The combination of mass democratic and popular power with the reluctance of the ruling authority to oppose the movement with violence explains its non-violent character. Charles S Maier, who analyses this development, is ambivalent about the results of the protests in Eastern Europe. Instead of a conclusion he only argues that the success of civil resistance requires a different sort of courage in the post-heroic world of the new stabilisation. Consequently, the contradiction between the process of a revolutionary-type mobilisation against Stalinism and the limitations of regimes that have attempted to introduce the mechanisms of capitalism is not examined in any sufficient detail. The instability of regimes in Georgia and Ukraine is explained by internal factors of incompetent politicians and corruption, when in reality it is the effect of a causal process related to the restoration of capitalism in Eastern Europe and the former Soviet Union.